Wow, what a wonderful blog you have! 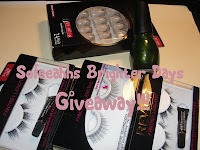 Love ur idea, and I would like to invite you to enter my blog's 2nd free giveaway. The prize is a Sterling silver and Swarovski crystal necklace. Hope to see you in my blog, thz!! !